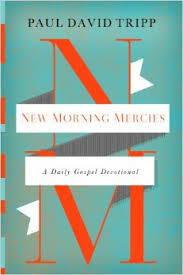 In New Morning Mercies: A Daily Gospel Devotional, Paul David Tripp writes that we are all on a conquest for hope. He shares several truths regarding hope I wanted to pass on to you. God has hardwired human beings for hope. We don’t live by instinct; we all find our identity, meaning, purpose, and inner sense of well-being on something. What you place your hope in will set the direction of your life. Hope always includes an expectation an object. Hope, to be hope, has to fix what is broken. Hope that doesn’t address your need isn’t very helpful. You always preach to yourself a gospel of some kind of hope. According to the Bible, hope is not a situation, location, possession or an experience. Tripp says that hope is a person, and His name is Jesus. If nothing you envisioned ever works out and all the bad things that you’ve dreaded come your way, you still have hope, because he is with you in power and grace. I really enjoyed “Dangerous Calling” by Paul David Tripp, and am excited to check this one out. Thanks for drawing my attention to it! It’s a fantastic book my friend. You’ll be encouraged and challenged!